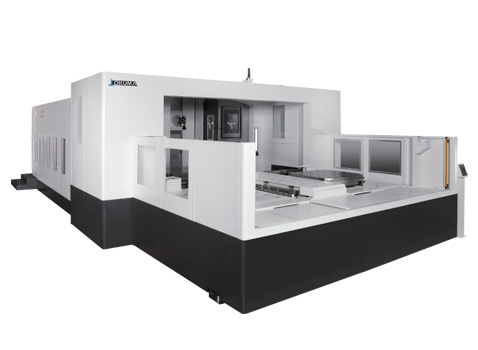 The MA-12500H, built on an integral bed and base and designed with reinforcing ribs for stability and carrying capacity, incorporates Okuma's Thermo-Friendly Concept to achieve thermal stability and precision. It is equipped with a 50-taper 6,000 rpm, 60/50 horsepower spindle and also available with either a 12,000 rpm wide range spindle or 4,500 rpm heavy-duty spindle. This machine balances speed and cutting power for machining of aluminum alloys, cast iron and difficult-to-machine materials with a maximum load capacity of 11,000 pounds and rapid traverse (X, Y, Z) of 1,653 ipm.